(Harrisburg, PA) – March 13, 2018 – Equity First and The Citizens for Fair School Funding recently declared #CivilFundingWar on Pennsylvania school funding and shared its 2018 battle plan. 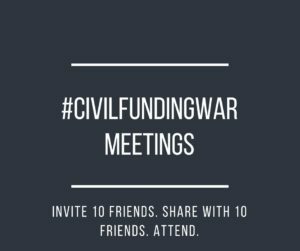 The group is recruiting Pennsylvania volunteers for 6-month enlistments to join the #CivilFundingWar for the May/June budget battle. The Dauphin County volunteers are meeting at St. Paul’s Episcopal Church in Harrisburg. Three (3) years after the historic adoption of the bipartisan funding formulas for Basic Education and Special Education, shockingly, only 6% of Basic Education funding and 8% of Special Education funding are running through the adopted new funding formulas. Tragically, this inequity makes Pennsylvania worst in nation in its discrimination against poor, minority students. Despite adoption of new formulas and three (3) successive state budgets, Pennsylvania state government continues to purposely underfund minority school districts and knowingly overfund white districts. Mostly white school districts, on the other hand, greatly benefit from this delay in fair school funding. RSVP to Shelly or visit EventBrite today! For more information, visit www.SupportEquityFirst.org and follow us on Facebook, LinkedIn and Twitter @EquityFirstOrg . No Replies to "Equity First and The Citizens for Fair School Funding Say No Overfunded School District Should Get New Money This Budget Year"